I have a present for you. Well, I don't really have it anymore because I made it a while back, but I can tell you how I did it. Will that work? Good. When I was first learning to make cakes I thought that I would really like to start working with fondant. I wanted something simple, yet something that looked really pretty. I started with two eight inch square cakes. 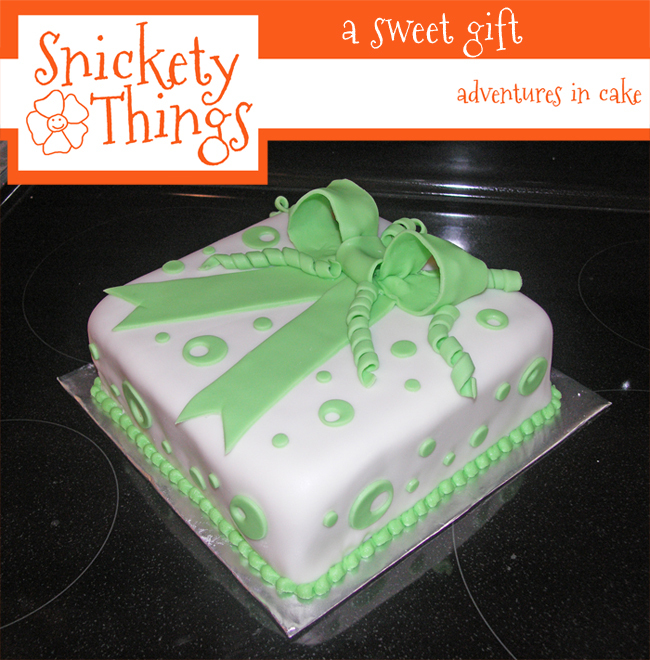 I hadn't used a square cake before so I wasn't even sure how to go about covering it with fondant. After all, in my cake class we had only covered round cakes with fondant. I went ahead and did a thick crumb coat with white butter cream. I put it aside to start working on my fondant. I used Wilton's pre-made fondant from a package. I started kneading it to get it pliable and worked in some flavoring to try to make it taste a bit better (it didn't work). Then it was time to roll out a nice big piece to cover the cake with. It was then when I realized the only completely flat surfaces in my kitchen are a 40 inch round kitchen table (it has two fold down sides so it isn't truly flat) and the top of my stove. I stared at the tile counters with contempt (and I still do, I hate tile counters). Things were not looking good. I did the best I could rolling the fondant on my table which worked out because that flat are it did have was just enough to get me my sheet. I coated the cake in a thin layer of clear piping gel to help the fondant stick to the cake and gently spread the fondant over it and smoothed it out (sorry, no pictures so a description will have to do). This is what I ended up with. 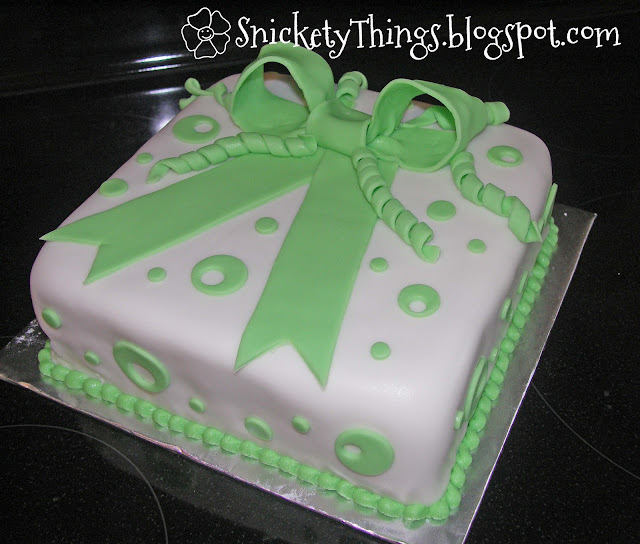 I tinted the remaining fondant green for the decorations. The bow was done in five pieces. 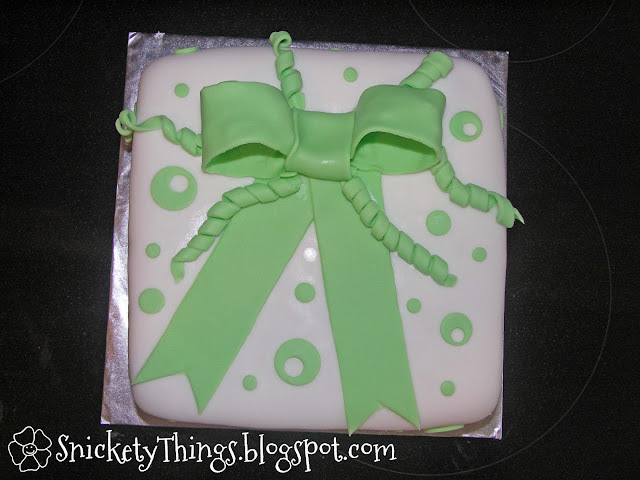 I cut out the bow tails and put them on the cake where I wanted them.I made loops out of two more strips and put them to make the bow. I used a little wadded wax paper in the loops to hold the shape overnight to let the fondant dry enough to stand on its own. The center loop I just carefully wrapped around and tucked in. The curls were an afterthought with the fondant strips I had cut off. I just wrapped them around a cake dowel and let them dry. I put them on the next morning. I cut out the circles using the big end of a large round Wilton tip, then turned it around to cut the smaller circle out of the bigger one. If you notice, I saved those little circles for the cake, too. They are glued to the cake using more clear piping gel. I just tinted my leftover butter cream to match the green fondant best I could and made a small shell border, I think I used a Wilton #18 tip. I really should have gone with a bigger shell. The lesson I learned from this cake was that if I work with fondant, it has to be able to cover small things or only work in pieces. Lets just say that I don't do it often at all. This is another beautiful cake you've made! 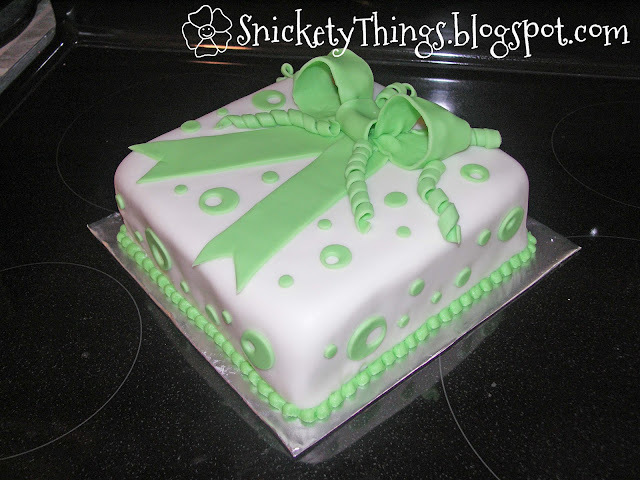 I've never tried fondant and wondered if I should take a class first or just dive right in. I do wish it tasted better. Your cake is wonderful! Thank you Holly! I learned a good bit in the class I took, but only basics. I'm sure practice would do as much. WOW! That is gorgeous. How could you stand to have anyone eat it?! Thanks Jenny, it was delicious! Except the fondant. Thanks! Good luck making more! I wish I could do that. It is beautiful! Thank you! It just takes a lot of practice. Looks great--I love the bow! I do cakes too, so I always want to click on them. This is really cute. I love the curls. Cute cake. I've never worked with fondant before. For some reason, it just seems intimidating. Your cake turned out wonderful! I'm visiting from the Making the World Cuter linky party. I would love if you stopped by my blog. I love the corkscrew bows. That was such a great after thought to use the fondant wrapped around dowels. Thanks so much for sharing at Whimsy Wednesdays! Wow, it's almost too pretty to eat! You did a great job. Thanks so much for linking up to Fabulous Friday at Faith, Trust & Pixie Dust.